Even with the proper amount of sleep and a good diet, you never fully feel awake until you’ve had some coffee. It’s the extra pep in your step you need to approach the day with clarity and new ideas. Of course, when we don’t get that extra boost, it’s hard not to get a little sassy. The local cafe is not always just a block or two away, and not being able to get your fix on a busy day makes everything seem much more difficult. Of course, if you have your own portable espresso maker, life would be infinitely easier. 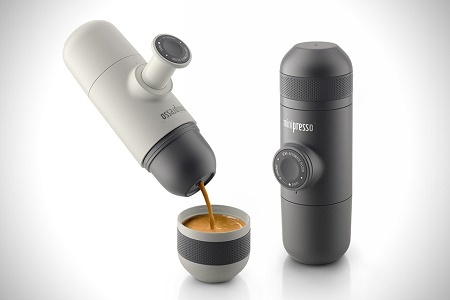 The Minipresso will let you decide how many pick-me-ups you need in a day, and requires very little effort on your end. Weighing less than a pound and measuring a little under 7 inches in height, this can easily fit into a bag, backpack, or purse without making you feel like a pack mule. The hardest aspect of this would be carrying around enough grounds and water to satiate your thirst. To use this, you won’t need to worry about needing compressed air, N2O cartridges, or charging, as it is all powered by you. Simply add in your grounds, pour in water, unlock from travel mode, and start pumping to get your liquid ambrosia. You can make up to two shots of espresso, and should you prefer using capsules of grounds, you’ll be happy to know that those work just as well. Putting down $39 while this is on pre-order will secure one of these for you, but if you wait, it will jump up to $49. This would certainly be handy to have on those long days where you come in tired and need more than one drink, but don’t want to pay cafe prices. Dronies – Dancing Airborne Robots for All! Because I’m an absolute dork and I also carry my own meat freezer and gas grill wherever I go.